Master of World of Warcraft : Snowballs are fun. I had some snowballs leftover from last Winterfest when Mists came out. 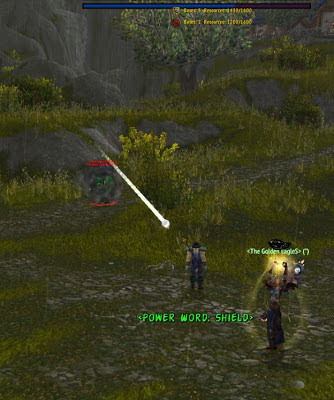 I remember in one particular instance, an Alliance mage and I were questing in the same area, eyeing each other carefully, giving each other space, and generally ready to kill the other in an instant if one of us fucked up. It never happened. In the end, right before we're both about to leave, he comes in with his water elemental, who starts shooting me with Frostbolt. The mage wasn't attacking though, realized what was going on, dismissed the pet, then backed away waiting to see if I'd retaliate. I didn't, but as soon as he turned his back I started pelting him with Snowballs. He turned around, just kind of looked at me, then punted a marmot at me. At this point we started using all those gimmicky little quest rewards on each other, until we ran out of snowballs and "weapons."